Service Reporting can be used after each service to record the number of people who have attended the services. If you have multiple service times for a service, simply click on the tab to report on the correct service time. There are a variety of ways to report on Service Attendance. In this area, search on the name you want to add for the Service. 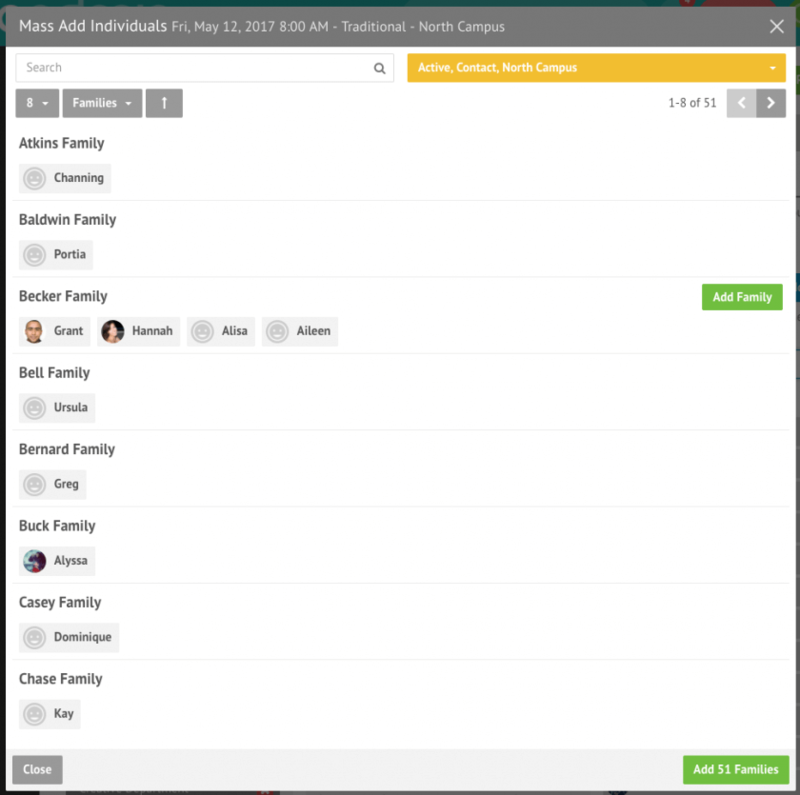 You can then click on the name of the person that attended, or click the “Add Family” button to add their entire family at once. Here you see we have added the entire Gordon and Ramirez families, and Leandra by herself. Guest Attendance can be added into Service Reporting. The Guests field can be found under the Built-in Statistics To add in the total number of guests, simply click on the ‘Edit’ button and enter the number of guests. 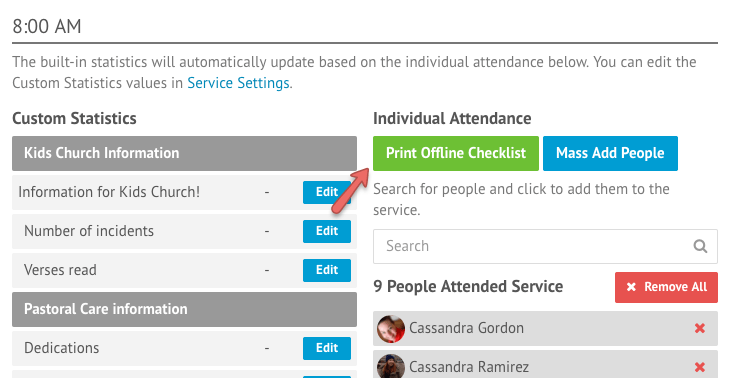 Simply click on ‘Print Offline Checklist’ button. A pop-up window will be displayed and you’re able to choose the columns, order and also other filters you want to generate the offline checklist. Here we select a bunch of filters to generate a sample offline checklist. Click ‘Print’ to generate the checklist. It will generate a PDF which you can save or print out. An example of how this looks like can be viewed below. 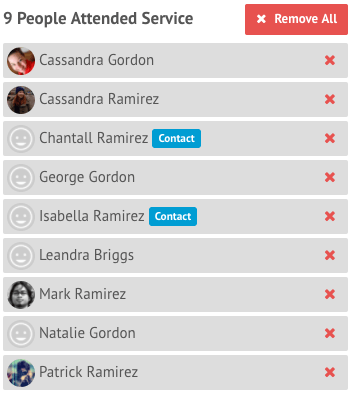 You can bulk add individuals to a service. Simply click on the ‘Mass Add Individuals’ button. 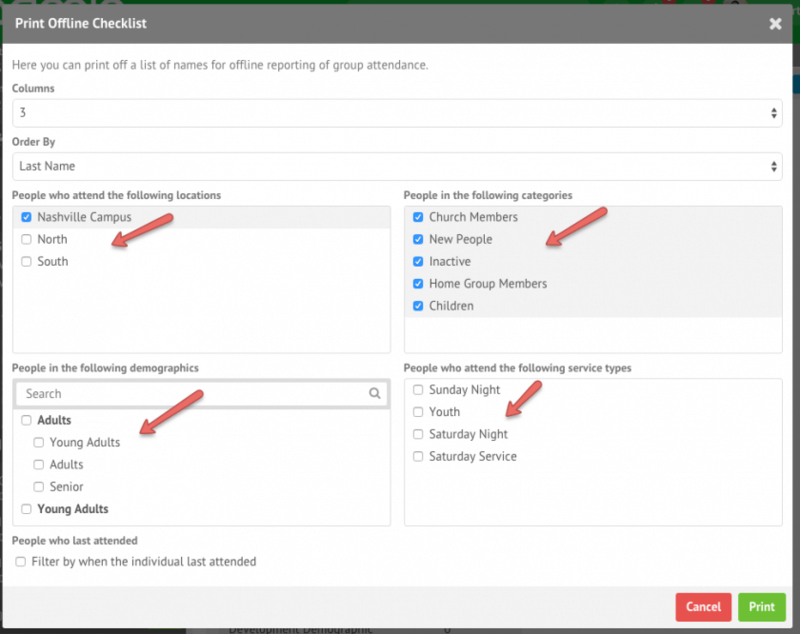 A new window will appear where we can start selecting which individuals attended the service. On the right hand side you can use the Filter dropdown to change which people appear. People already added to the service will not appear in this window. When submitting a group report, you can link it to one or more services. 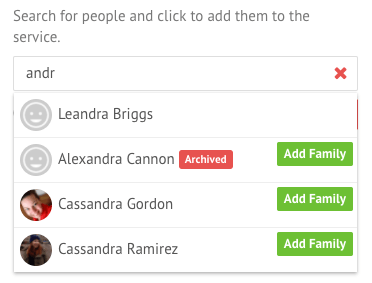 Simply set the ‘Date Met’ to the same date as the service and select the people you want to record as attended. If you enter in the number of ‘Guests’, the linked group report will then link to the total guest number for the service. Please note that Custom Statistics of Groups will not be linked to Services. Click ‘Submit Report’ to save. 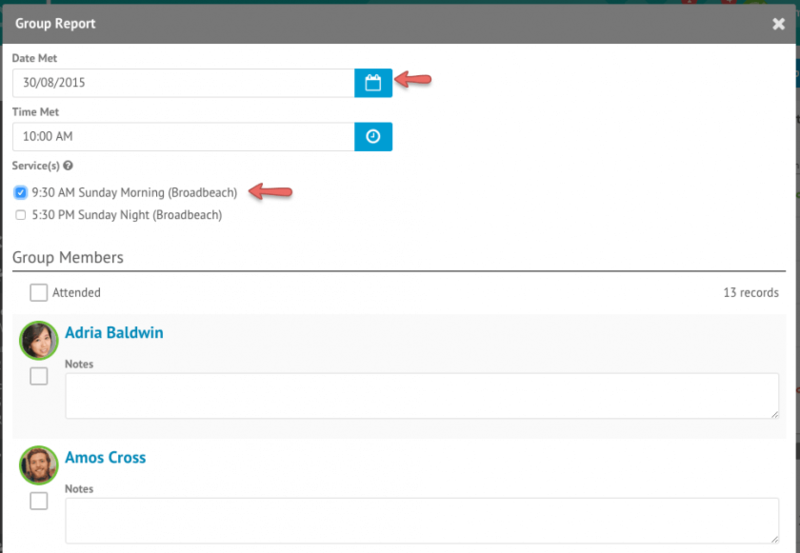 You can import service attendance from a CSV. More details can be found in this article. Adults or Children who are checked-in for the service will also have their attendance recorded against the service.